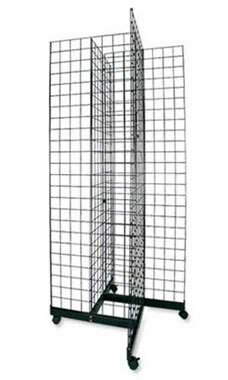 Put first class selling power behind your merchandise with this attractive, versatile 4-Way Grid Tower. This tower comes complete with a Base and Casters, which makes assembly simple and easy. Measuring 6½' off the ground this unit is great for a great number of accessories. This Gridwall unit includes 4 grid panels, connectors and base with casters. The bottom of this unit measures 36” x 36”. Shelves and Faceouts sold separately and at the lowest price available, also here at Store Supply Warehouse. In stock and available for immediate shipment. I was able to assemble the tower by myself which is important as I am using it for art shows and must put it up and take down at each show. Delivery of the product was as expected without any delays. This 4-Way Grid Tower, Is great!! Easy to use and assemble. Provides display felxibility in a relatively small footprint. The base with casters makes set up easier. I plan to use all of the accessories for this one. Should hold an entire collection for display!